It's been a while since I've done a giveaway here on Comptonia, but something came in the mail today that seems like a perfect Thing To Share. I've mentioned the Sow True Seed company before. I like this company a lot, both their mission and their catalog, and I'm grateful to Tipper from The Blind Pig and The Acorn blog for sending me their way. Sow True Seed is a big part of the annual adventure in sweat and emotion I call "gardening." 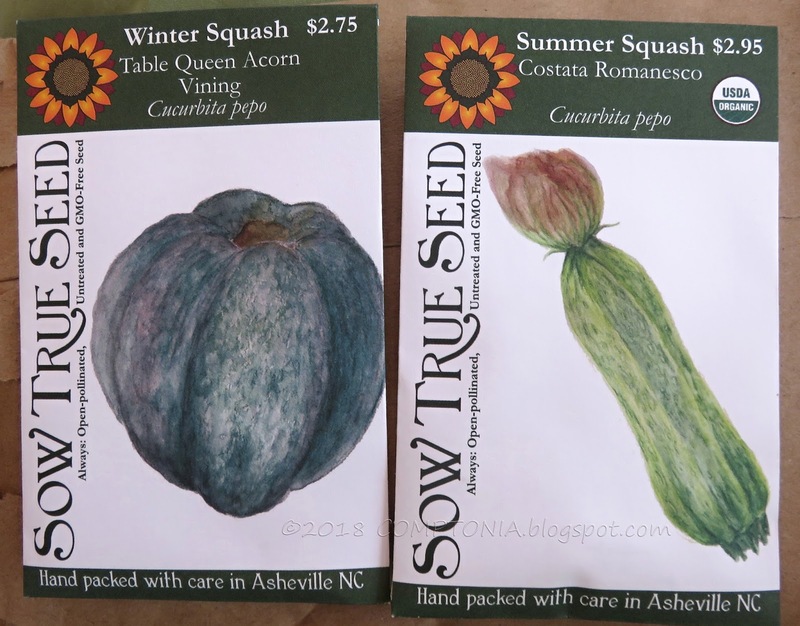 This year, in response to a rather challenging winter which is ongoing, I have already ordered my seeds, including lettuce and candy roaster squash and little short-season melons. 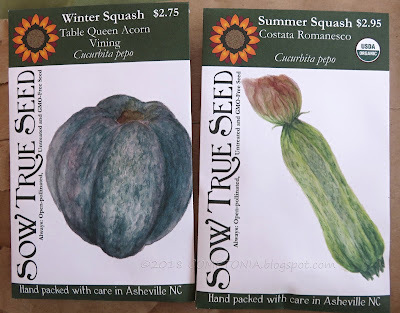 These squash seeds are not actually part of my order, but I have a couple of packets to share. If you think you would like to win a packet of either variety, just leave a comment on this blogpost. Any comment will do, but if you include a gardening tip it will count as a second entry - we all need all the gardening tips we can get, don't we? Please feel free to share this in any way and with anyone you think might be interested. I don't mind folks just dropping in to Comptonia to enter a giveaway. I'll draw two winners at midnight on March 30th and post the names on March 31st. Seeds! Just a little something to help turn the page on the month of March. And...ahem, coughcough...not to make a fuss about it but... you happen to know the person who painted the watercolors for the seed packets.